Last week we showed you some booth inspiration and you guys were all over it! So, we are pretty excited to have another post of booths for you to be inspired by. Thanks to all the makers who gave of their time contributing to this post! What are the basics of how you constructed the booth and what materials did you use? My booth arrangement varies depending on the show, the booth dimensions and whether or not I have a corner spot. The basic idea: Tables (all on bed lifters to put items closer to eye level) and a variety of display items that allow for different heights in the display to create visual interest. The newest addition are the vinyl walls. I had 10 foot by 7 foot walls designed and printed on vinyl -- just like you would for a banner. The walls show three different bathroom scenes and have Shower Art hanging up in different spots in each. I've been doing shows since 2007 so I've invested quite a bit in my booth over the years. The walls were the most expensive and ended up being close to $800 total. Why has the booth worked so well for you? My booth is very colorful and attention grabbing. 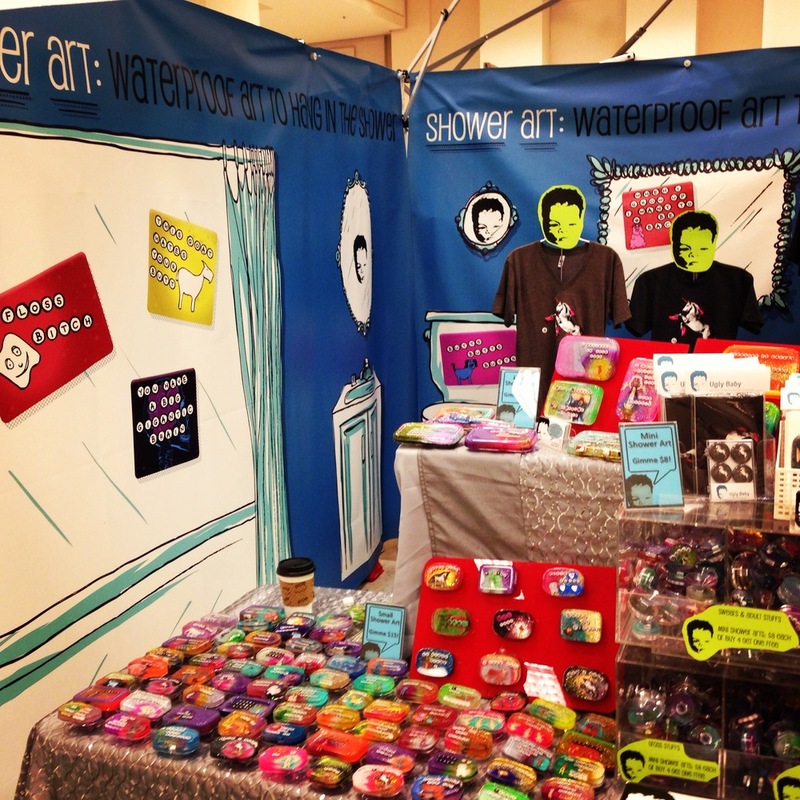 Plus, with the blown up versions of Shower Art depicted on the vinyl walls, it shows the customer how they would use it -- and lets them read the funny phrases on Shower Art without having to look at the smaller art pieces themselves. What is a typical customer reaction or what customer problem did it solve? In the past, people would sometimes walk by my booth and think that we sold baby items because of our business name: Ugly Baby. Sometimes they would think we were selling soap and walk on by. The large versions of Shower Art on the vinyl walls give the customer a much better idea of what we're selling and what our sense of humor is without having to even enter the booth. Hurray! For the walls we used 3' x 6' masonite panels we painted ourselves and used hooks to keep them secured to either the event walls, or our own freestanding walls. The shelf ledges were from Ikea and were affixed to the walls as-is. They were secured to the walls with screws and also designed so they can be removed for travel. The tables/furniture were mainly from Ikea so we could easily take the furniture apart for transporting. The rug was something that helped take the attention away from the concrete floor, just to help bring the whole atmosphere together. The total figure comes out to around $2k for the whole setup. One advantage is much of the setup can be collapsed and is relatively easy to travel (though a large van is needed). We wanted to go with a less cluttered appearance to make sure that attention wasn't taken away from our product, while still emphasizing on our clean aesthetic/branding. What is a typical customer reaction or what customer problem did it solve? We often receive compliments about the booth design and construction; sometimes we hear that it looks like a room from someone's house. We're relatively new on the market scene, so a lot of people are under the impression that we've been doing shows for years when they see our booth, and we like that. Our main goal in creating the booth that we did, is to evoke an emotion or a reaction so that we hopefully be just as memorable for their next visit back. While we feel we've accomplished that, we are still constantly trying to figure out how we can make improvements to the layout, traffic flow, and the way we display our products. Unique LA Spring, Summer, Holiday; Patchwork Long Beach & Santa Ana Spring, Holiday; Long Beach Folk Festival; Down Town Artist&Flea. Wood was my material of choice. I spent a day planning and gathering materials and the necessary Hardware. Then I spent a day cutting and constructing my compactable display on wheels. About how much did you spend? $250 was my budget and I spent $286. I did my best to use scraps and materials like plexi glass that I had been holding on to for some time now. My booth tells a story of what it is that I sell. I put a modern spin on an old-timey bar, then made it compactable and on wheels. It works well for me because I'm a one woman shop and have to load up and off load by myself as well as set up. so having it in piece that clip together and hinge into position is not only space saving but time saving and labor saving. They usually cant believe I built my entire display from scratch. The wooden cash register that spins usually gets a good laugh, followed by "That's awesome". Having prices for the different sizes flask clearly marked in front of each size really help answer the age old question "how much is this?" 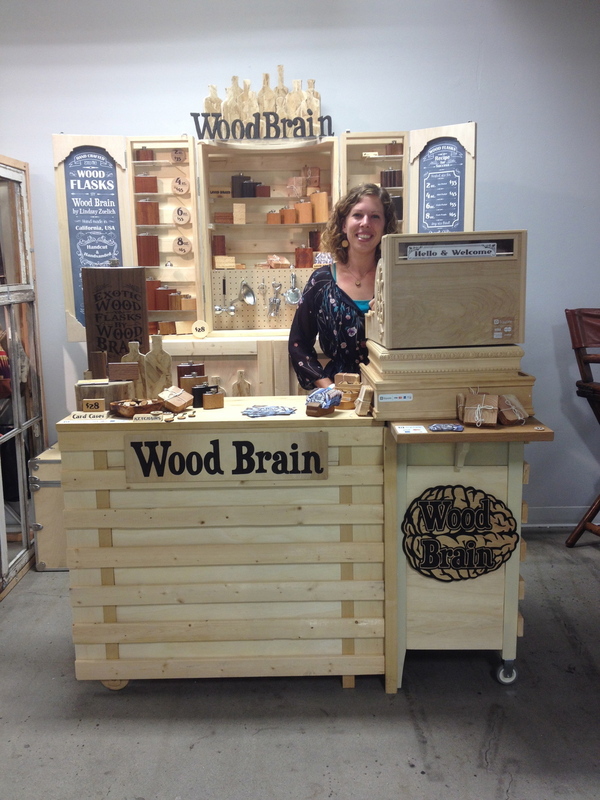 Want to learn more about how craft shows fit into your business? 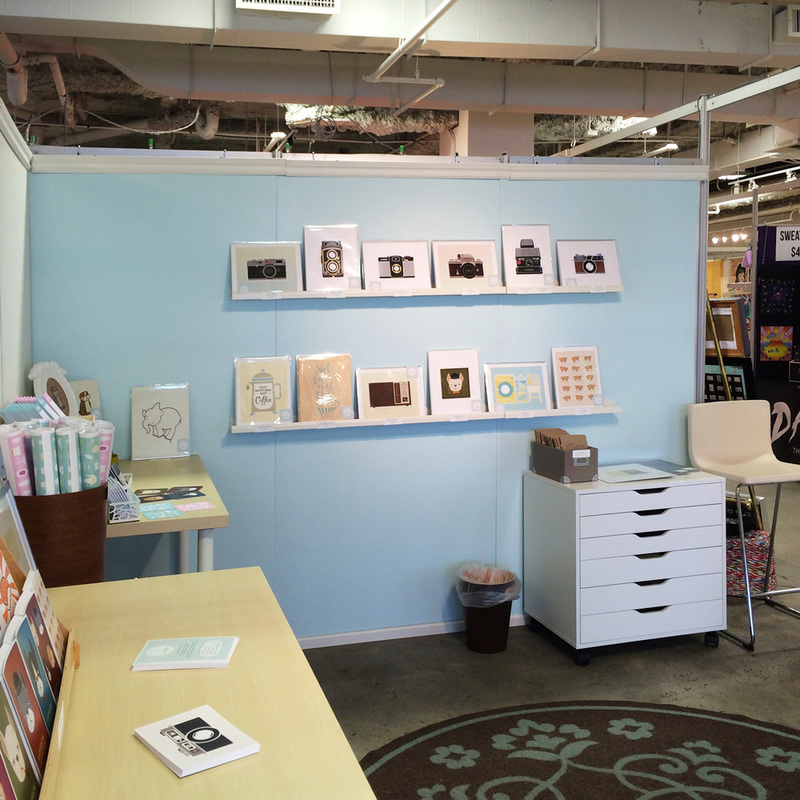 Many makers begin their selling journeys with craft shows. They are a great way to meet customers, get live feedback on your product and even connect with other makers. But they can be a grueling day (or more!) and there is a lot of competition out there right now it can be hard to know which ones are right for your business (if any!). Show producer Nicole Stevenson shares how to think about integrating craft shows as a sustainable part of your business in our webinar "Craft Shows & Your Business".